Business Info: J. Howard Properties is fueled by a passion to find the perfect property for every client’s taste and lifestyle. This boutique real estate firm is located in beautiful Miramar Beach and was started by founding partners, Jennifer Howard and Kimberly Dickey. We have exceptional agents who can find you your perfect luxury, beach front, bay front, or golf retreat. Whether it is a full time residence, second home or investment property, we can turn your dreams into reality. J. Howard Properties is a full service residential real estate firm serving the following areas along the inspirational Emerald Coast of Florida: Destin, Miramar Beach, the communities along Scenic 30A, Panama City Beach and Panama City. 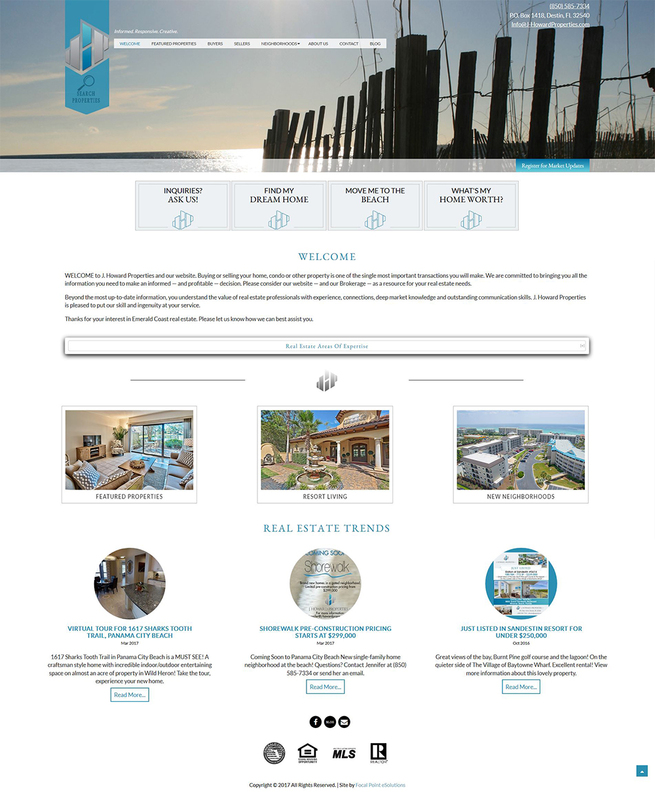 Project Info: Focal Point eSolutions provided website design, custom HTML and CSS coding over the Wordpress Content Management System (CMS), IDX integration using iHomeFinder's Wordpress plugin, and search engine optimization. The site was coded to be responsive to the screen size of the device used to browse the website. Focal Point eSolutions will continue working with J Howard Properties to ensure the site is maintained and continues to grow internet presence.